Grace Presbytery, Synod of the Sun and the General Assembly Mission Council, is to create a mission center that houses a Presbyterian congregation. Shane Whisler of East Broad Outreach Center poses with custom made clothing made by a woman who works part time at a silk screening business. She did so out of gratitude for the food and moral support given to her at the new church development in Mansfield, Texas. Whisler is quick to credit the vision for this mission center outreach to leadership within Grace Presbytery and a dedicated steering committee that opened the door to him and his wife in October 2010. “The Holy Spirit and mission work, big and small, across our denomination are our inspiration for this approach to church planting,” he says. “The vision for this mission center lined up exactly with what we’d been praying about for seven years,” adds Felter. 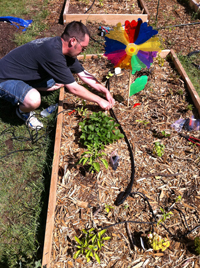 A father of two Girl Scouts installs an automatic drip irrigation system this spring in the organic community garden at East Broad Outreach Center, Mansfield, Texas. He volunteered for the job and donated many left over supplies from his own yard work. via Presbyterian Church (U.S.A.) – News & Announcements – Farmhouse becomes mission center to house new church development. The following is a list I found on a blog by Justin Buzzard, pastor of Garden City Church in San Jose, CA (link to blog at bottom of article). If you check out his blog you will also find the positive version of this list (10 Reasons to Join a Church Plant). I find this list compelling because it is a good reminder that what we are trying to do may be different than some people’s conceptions. 1. If you’re looking for the next cool thing in town (We want to grow by conversion growth, not church-goer transfer growth). 2. If you’re a Christian and you don’t like your current church (You will find reasons to not like this church). 3. If you have a bad track record at churches of being unteachable and causing problems (You won’t change here, you’ll repeat the pattern). 4. If you’re a consumer wanting to “go to church” 1x a week for a nice show (We are not a Sunday show, we are a community of disciples on a mission). 5. If you want religion (This church will be built on the radical gospel of grace). 6. If you have an agenda (We have our vision, our mission, and our values–your private agenda does not supercede them). 7. If you’re a wolf (We will sniff you out). 8. If you think this will be a nice little church that stays the same size, where everybody knows your name and you have my cell number on speed dial and we have a picnic lunch together every week (By God’s grace, we want to grow). 9. If you think this will be easy and smooth (This will be hard and difficult; this will be a fight, a battle, a challenging mission). 10. If you want to hold onto your comfortable life (You must lose your life). via » Top 10 Reasons NOT to Join a Church Plant Buzzard Blog. A Missional Community is a Family of Missionary Servants who make Disciples who make Disciples.Family – First of all a missional community is a group of believers who live and experience life together like a family. They see God as their Father because of their faith in the person and work of Jesus Christ and the new regeneration brought about by the Holy Spirit.This means they have and know of a divine love that leads them to love one another as brothers and sisters. They treat one another as children of God deeply loved by the Father in everything – sharing their money, time, resources, needs, hurts, successes, etc… They know each other well. This knowledge includes knowing each other’s stories and having familiarity with one another’s strength and struggles in regards to belief in the gospel and its application to all of life.They speak the gospel truth to one another, regularly building each other up in love. They also love the people around them as if they were part of the family, showing them what the love of the Father looks like and in so doing inviting them to experience life in the family of God.John 1:11-13; Rom. 12:10-16; Eph 5:1-2Missionaries – God’s family is also sent like the Son by the Spirit to proclaim the good news of the kingdom – the gospel – and fulfill the commission of Jesus. A missional community is more than a bible study or a small group that cares for other believers.A missional community is made up of Spirit-led and filled people who radically reorient their lives together for the mission of making disciples of a particular people and place where there is a gospel gap no consistent gospel witness. This means people’s schedule, resources and decisions are now collectively built around reaching people together.Matt. 3:16-4:1; Jn. 20:21; Acts 1:8; Acts 13:2Servants – Jesus is Lord and we are his Servants. A missional community serves those around them as though there are serving Jesus. In doing so, they give a foretaste of what life will be like under the rule and reign of Jesus Christ.Living as servants to the King who serve others as he served, presents a tangible witness to Jesus’ kingdom and the power of the gospel to change lives. A missional community serves in such a way that it demands a Gospel explanation – lives that cannot be explained in any other way than by the Gospel of the Kingdom of Jesus.Matt. 20:25-28; Jn. 13:1-17; Phil. 2:5-11; 1 Pet. 2:16Disciples – We are all learners of Jesus our rabbi who has given us his Spirit to teach us all that is true about Jesus and enable us to live it out his commands. Jesus commanded us to make disciples who believe the gospel, are established in a new identity and are able to obey all of his commands Matt. 28:19-20. The missional community is the best context in which this can happen.Disciples are made and developed: 1 through life on life, where there is visibility and accessibility 2 in community, where they can practice the one anothers, and 3 on mission where they learn how to proclaim the gospel and make disciples.What do you think about Jeff’s definition of missional community? What other questions does this leave you with? Join the conversation in the comment section below…Jeff Vanderstelt is a Church Planter who leads Soma Communities, a body of church planting churches in the South Puget Sound. He also serves as the Vice President West of Acts 29 as well as the Church Planters Advisory Counsel for the Conservative Baptist NW Association. Jeff spends most of his time equipping church planters and church leaders in Gospel Centered Leadership and Missionally focused methodology. He has been planting churches for 7 years. Prior to that he was a youth pastor in four different churches over the span of 14 years, the most recent being Willow Creek Community Church in Chicago. Jeff has been married for 18 years to Jayne and together they love and shepherd 3 beautiful children in the Gospel and Mission of Jesus Christ. Twitter: @JeffVanderstelt. via Jeff Vanderstelt: What is a missional community? | PRINTABLE | Verge Network. Mike Breen: Why The Missional Movement Will Fail | ARTICLE | Verge Network. This is an interesting article. Click on the title to check it out. As I read it I realized that I never thought that it was possible to be “missional” without making disciples. I’ve always assumed that we would be doing both. After all, isn’t that the mission that we have been charged with (Matt. 28:18-20)? Can you be on mission for God without being a disciple? Can you be a disciple without participating in God’s mission? via Presbyterian Church (U.S.A.) – News & Announcements – ‘A wave of the Spirit’. This is a great article about what the Spirit is doing in some traditional churches in the UK. It has a lot of relevance for what we are talking about with our plans for a “daughter church.” Thanks for sharing it Corey!